New York's Metropolitan Museum of Art is holding a splendid exhibition of Turkmen jewellery culled from the collection of Marshall and Marilyn R. Wolf, who recently gifted 250 works to the Met. 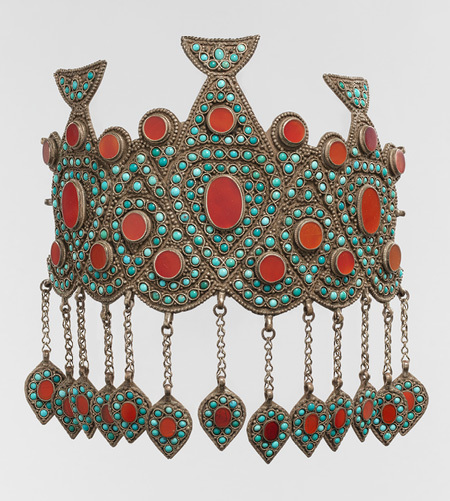 A selection of 43 finely crafted pieces, on display until 24 February 2013, showcases 19th and 20th century Turkmen culture. The couple, frequent visitors to Central Asia and the Middle East, started as textile collectors and were later drawn by the strong, bold jewellery pieces in the 1990s. According to the Met's publicity: "the exhibition is organized according to the principal techniques employed by Turkmen silversmiths. One grouping shows fire gilding, a technique in which gold filings—possibly obtained from coins—were combined with mercury in a paste that was brushed onto prepared silver; heat drove off the mercury, and the remaining gold was burnished to a brilliant sheen. Other items feature stamped beading that was produced by stamping metal from behind to obtain the appearance of individual beads or granulation on the front. A third section focuses on the inlay of carnelian and turquoise using bezels. The fourth major technique—openwork decoration—involved the use of a chisel or fine fret saw to cut through silver sheets. Many of the items on view, in various techniques, include small bells suspended from chains, which would have added an auditory component to the jewelry. 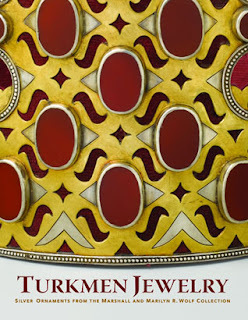 Some motifs in Turkmen jewelry are similar to those found in textiles from the area. For example, repeat patterns of squares, rectangles, or lozenges can be found both in silverwork and in carpets. The repertoire of motifs varies according to the tribe of the maker and owner, and the exhibition will highlight distinctive designs from Teke, Yomut, and Kazakh jewelry-makers". Those of you with a particular interest in jewellery and unable to visit the exhibition, can pick up a copy of the gorgeous catalogue through regular online bookstores. It is the first publication in English about Turkmen jewellery. At the Savitsky museum in Nukus, passengers on Uzbek Journeys tours have the chance to see exquisite examples of Karakalpak and Turkmen head dresses, amulets and other ornaments.